The National Science Foundation is funding an effort called the Macrofungi Collection Consortium. This is an effort by 35 institutions, including the New York Botanical Garden, to digitize a combined 1.5 million specimens of fungi collected over the last 150 years. This presents an opportunity for Citizen Scientists to get involved and make a contribution to the mycological field. In collaboration with notesfromnature.org, a transcription project built to help categorize the estimated 2 billion specimens of plants, animals, and fungi kept around the world, the Macrofungi Collection Consortium hopes to transcribe the labels for the recently digitized specimens. Here's an example of what transcription entails. There's a prompt at the bottom as to which field needs to be identified. You "simply" examine the provided labels and enter the requested information. 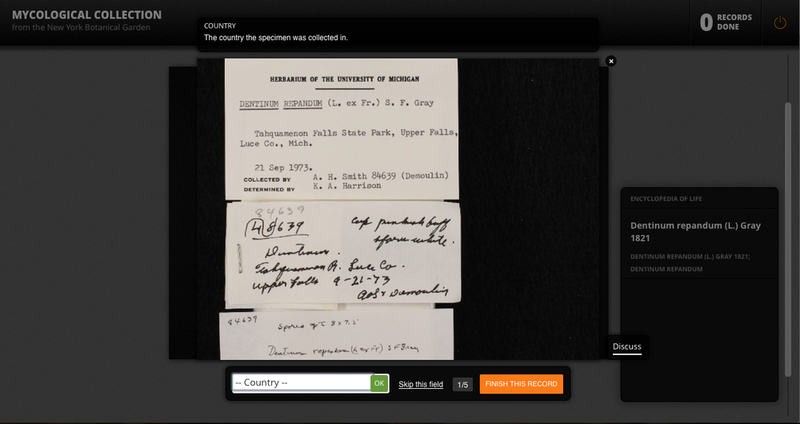 As you can see, the specimens lacking typed or easily legible tags become a bit of a challenge! They need help in this undertaking. To get involved, visit the Macrofungi Collection Consortium page on notesfromnature.org, sign up, and begin transcribing samples. It is, admittedly, not the most glamorous contribution that one can make to science, but it's an important one. The dried specimens often look little like their living counterparts yet this new digitized record will assist scientists and other mycophiles in their studies by adding more data about locations that certain specimens were found, in what types of environments, and when. This added context is important to understanding the roles that these organisms play in the ecosystem. So if you've got some free time, maybe you can't sleep and don't have a book to read, hop on and contribute to science! While you're there, check out some of the other projects that zooniverse, the web based citizen-scientist organization that runs notesfromnature.org, has going. You can hunt for new planets, categorize cyclones, or even help find a cure for cancer!